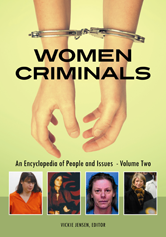 Women Criminals: An Encyclopedia of People and Issues addresses both key topics and key figures in women's crime. The first volume provides topical essays about areas critical to the understanding of female criminals, such as the definition of women's crime, explanations of women's criminality, ethnic and age diversity in female criminals, and responses of the criminal justice system. The second volume comprises biographical entries profiling women who are obviously criminals, such as Aileen Wuornos and Myra Hindley, and also women who were victims of circumstance, unjust laws, or narrowly applied definitions of crime, such as Rosa Parks, Harriet Tubman, and Sophie Scholl.